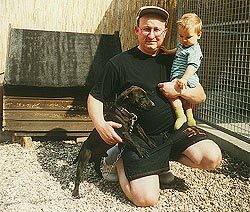 Specialized in the world`s finest terriers since `85 and the pioneer patterdaleterrier-kennel in germany&france! We imported over the last years at least 19 Patterdales directly from the United Kingdom out of the best lines available to built up our breeding background.We picked them all up in person to see in advance what we get.Some of them didn`t make the grade because we prefer the hard,throughbred, smooth coated ,bully-headed,right sized Patterdale type above all others.ALL our foundation brood stock was directly imported by me from the UK.Basicly mostly good old Nuttall-blood directly from Brian`s fine yard like "Digger" with a touch of Gould-blood via dogs from Gordon Mason/UK and Glyn Jones/UK.They were the result of an decades-long linebreeding in the UK with only one purpose in mind and thats working ability.These dogs are/were as perfect as possible and are proven PL- and HD-free checked.They have past the test of time BEFORE they became part in our serious breeding program .Our main goal for breeding Patterdale Terriers is to maintain their natural working ability. However, we do realize that some of our puppies will go to pet homes. They make wonderful pets and companions. All of our Patterdale stock were either directly imported by me from the UK or are from Patterdales that were imported by me. Our plans are to use only UK imported bloodlines. We are in no way competing with any show-Patterdale breeders. All our Patterdales are PTCA registered and we are devoted to genuine Patterdales so all my dogs are very well through/linebred and NO mixed up junk. Individuals from my yard have been carefully and selectively bred from proven producers and performers from pure UK-bloodlines that have been WORKING consistently for over +100 years. The conformation and health of our Patterdales is what a hardy, working Patterdaleterrier should be. We have not had any of the health issues that sometimes appear in the lineage of show-type Patterdales. We have had no health issues with any puppy directly from our kennel out of our breeding program and can provide references upon request .All of our puppies are vet checked,chipped, de-wormed and vaccinated along with the very best sozializing you can imagine before leaving our kennel. We have two veterinary docters currently working with us since years ensuring the very best of care is provided. When you purchase a puppy directly from us, it comes with the best possible guarantee on health and performance attached. However, if you have any questions after purchasing one, we are here for you&our dogs all the time.Most of the time we keep all our patterdales together as a pack and have hunted them regularly single-handed on badgers and foxes.In recent years we work them more on wild-boar battues as a "boar-pack".These dogs are actually "ALLROUNDERS" and they are as good as any.Nothing fancy or to brag about just good,solid dog-material with a very relaxed behaviour, an excellent self confidence and the extreme,breed-typical kindness towards people especially amongst children.Besides their working ability they are truely nice looking "eye-catchers" with plenty of charisma! Something a dog never can learn!!! Serious inquires and visitors are ALWAYS welcome!For any further information feel free to contact us via e- or snail mail via our contact button or give us a call ( from the states: 011491727226066 ) Keep in mind the time differance!